Am I Still a Believer? So what did I do to celebrate Worldwide D&D Game Day? I played D&D! It was the second Saturday of the month, so that made it D&D day anyway. But we got to talking, and decided to head down to Tacoma to visit a couple of the game stores that were participating in the festivities. We stopped in first at Table Top Games, where they had regularly-scheduled D&D Minis and RPGA (Living Greyhawk) events planned in addition to the special activities. We hung out there for about an hour, talking with folks, signing books, and browsing the merchandise. Then we went up the road to The Game Matrix, which had just one table of the introductory D&D adventure going on. Many thanks to these two stores for welcoming us (on pretty short notice) and showing us a good time! Then we came back to my house for the gaming. It's October. As I was cleaning the house on Friday, putting away some of the Halloween stuff my son has been accumulating these last few weeks, I realized that Halloween was coming up and I should make the most of it. So I put together a dungeon crawl with some pretty creepy elements. I didn't go overboard with it, and I didn't even tell the players that I had a creepy game in mind. Not like sitting down with the lights dimmed to play through the original Ravenloft module or anything. So back in Stormreach, the PCs met back up with Tala Karrna after their weird little expedition to the village of the catfolk (in Mellorn Hospitality, from DUNGEON, which we played at our last session—in July!). The kindly Professor informed them that agents of the Emerald Claw had made one more attempt to steal the mysterious rod from her while they were gone, but that she was rescued by an Exorcist of the Silver Flame. This Exorcist then went on to tell her that he was seeking a powerful artifact of good in a lost temple, and that it was imperative that it be found before the Emerald Claw could grasp it. He hired Tala, and the PCs through her, to find this artifact and keep it from the clutches of the Claw. So off into the jungle the PCs traipsed once more. I fast-forwarded through weeks of jungle travels, ending when the party arrived at the Marsh of Desolation. This swamp was dismal and desolate indeed: Gwen's character (Phenn) caught mindfire and lost some Intelligence. None of the PCs could get a restful night's sleep because of nightmares arising from the great evil of the place. They fought off a will-o-wisp (no easy task in such a dense fog), and then arrived at the temple fatigued and worn. Inside the temple, they launched into a fight against two yuan-ti purebloods. Even as another pureblood and a half-blood appeared to aid the first pair, some ghostly apparitions started manifesting in the area. They were basically phantasms, manifesting first as the sound of distant chanting, then as ghostly glowing green lights floating toward the great ebon doors, then as ghostly figures wearing robes remarkably like the tattered vestments worn by the yuan-ti. In front of the doors, a fifth yuan-ti blocked their path—this one an undead monstrosity (basically an akutsukai from Oriental Adventures), that slammed Andy's character (Kalar) with a point of Taint. Turning that bad boy enabled the PCs to fight off the rest of the yuan-ti, including one last abomination, before dealing with him—and finally the PCs stood alone in front of the night-black doors. Phenn decided to try to channel positive energy into these black doors. Her first attempt (pretty lame) turned the black stone momentarily granite-gray. Her second attempt (even more lame) I described as like a breath of warm air on a cold glass, sending a merest blush of gray through the black. Cameron's warforged character (Stratos) at that point decided to just beat the thing down. He took some damage from the negative energy-charged door, and failed despite a pretty good Strength check. Then Steve's artificer (Jeb) produced a knock scroll and opened the door. Inside, the ghostly apparitions were gathered in front of a terrible statue of some unknown charnel god. The glowing green lights danced like serpents of flame over their heads for a moment, then plunged into them, sending them writhing to the floor (the apparitions, not the PCs). At the same time, a wraith (with the evolved template from Libris Mortis) was manifesting near the statue. Stratos (or maybe it was Jeb with his undead bane crossbow) did it a lot of damage right off the bat, and it was reluctant to hide in the walls too long because it had already used its 1/day haste spell-like ability on itself. It hit Kalar hard, took his Con way down—and smacked him with another point of Taint. But then it died. As it died, the statue crumbled, leaving a gaping hole in the floor through which a wholesome golden light shone. The PCs found a room below, very much like the one where they had found the evil scepter some time ago (the same Shrine of Justice tile). The statue wore the mithral crown they sought. Fearful that the statue might turn into an erinyes the way the last one had, they camped for the night before touching the crown, tallying up the other treasure in the room in the meantime. Morning came, and they snagged the crown without incident. Jeb put it in his pack and the party emerged from the lower room. To find agents of the Emerald Claw camped out at the entrance to the temple, apparently awaiting their emergence. As battle erupted, Tala Karrna urged Jeb to give her the crown, saying that she knew how to use it to fight these guys off. Steve didn't quite trust her, but rolled a 1 on his Sense Motive and dutifully handed the crown over. As the gravehounds, Emerald Claw agents, clerics of Vol, and ogre zombie advanced, Tala bravely rushed forward—and got up on the back of the fiendish warhorse behind the nasty blackguard leader of this band... who had the evil scepter in his hand. Brave Phenn chased them into the swamp, even after the blackguard socked her with a fireball from the scepter. Her little weasel familiar latched on to the horse and dealt a point of damage each round. Finally, fearing another fireball, Phenn gave up. At about that time, the ogre zombie got a crit on Stratos and smashed him to pieces. It was simultaneously glorious and really depressing. Never have I handed a group of PCs such a defeat. Utterly betrayed by an NPC they had come to trust, at the cost of Stratos's life, they were pretty disheartened. But they were also really angry at the Professor, and I think that's really good. Next time, they're going to start making plans to track her down, which should drive the campaign for a while. Oh, I have great plans for Tala Karrna, yes indeed. Here's the really funny thing. Tala Karrna appears in the Sharn: City of Towers sourcebook that Keith Baker and I wrote, coming out in November. She's a professor at Morgrave University who's an agent of the Emerald Claw. I knew that almost all of my players would have that book dropped on their desks at work in a couple of weeks, and somebody was sure to run across her and uncover her treachery that way. So I figured that I had to do the betrayal thing in this session, before everyone got their copies of the book. But I discovered just this past week that her name got changed in development or editing of the book, so the players might not have caught it. Well, they still might have, so it's just as well. Besides, it was a great session. Last Sunday, my wife and her newly-formed liturgical dance troupe danced in a Methodist church in Bellevue—the church where one of the women in her troupe is an associate pastor. The dance was great. Every time I see my wife dance, I am struck by the palpable grace coming from her. It's an experience that merges the two senses of the word "grace" for me. Then came Communion. Oh. Problem. See, we Methodists often take Communion by intinction, which is to say taking a chunk of bread and dipping it into the cup (of grape juice), then partaking of the soggy body/blood combination. Which leaves me stuck. I can't eat the bread, obviously, so no dipping for me. In theory, I could just drink from the cup—except that, unless I'm the first person up there, there's an abundance of gluten-laden crumbs swimming around in the cup. So no Communion for me. This made me very upset at first, as it had at the Renton UCC/Disciples church a couple weeks ago. And particularly since, as we went into the Great Thanksgiving, I turned to my wife and whispered, "Oh yeah, I am a Methodist!" The familiarity of the ritual was comforting. But then to be cut off from participation in it felt especially painful. So I sat there feeling sorry for myself yet again. Then that grace thing happened. Our son had chosen a seat right up front and on the left side of the sanctuary. So we were right by the associate pastor, Crystal, as she was serving people on our side. I was watching her for a while, how she touched everyone who came up—laying her hand on the heads of children or gently touching the arms of adults—and called most everyone by name and was really present with them, serving them. And suddenly I was able to let go of my self-pity and accept the grace that God was offering me through the sacrament—without physically participating in the sacrament. We Methodists talk about sacraments (Communion and baptism) as means of grace, and I have always cherished the idea that God's grace can come to me through the bread and cup without any particular openness on my part, that I don't need to get myself in the right frame of mind or somehow make Communion a special experience for myself—God's grace flows through the sacrament whatever I do and whatever state I'm in. So this was the first time I had experienced that as a witness to the sacrament rather than a real participant. Check out "Grace" performed by U2 and by Nichole Nordeman . It seems to me that there are two kinds of productive days. But there's another kind of productive day, which perhaps only occurs at the office. Today was one of those days. I finished up an overdue map order for d20 Past, started a concept art order for an unannounced book, and in the midst of all that managed to get about 950 words written on my current project (a different unannounced book!). We also had a design team meeting today, where we talked about the introductions to books, siege engines, substitution levels for the book I'm working on, the right amount of psionics content in any given book, and the development process. It was a long day and a busy day, and I really only finished one thing (the map order), but wow, it felt productive. Not such a productive night, though. I'm intentionally staying up a little late, because I have a sleep study tomorrow night and I want to be tired when I get there (not like last time). So I came out after getting both my son (9:30) and my wife (10:30) to sleep, intending to work on my Eberron novella. Two hours have passed, and I've edited a couple of words. I've also watched several music videos on the iTunes Music Store, surfed every Mac-related web site I know of in hopes of emerging news from Apple Expo Paris (the keynote is supposed to start at 1 A.M. Pacific time—24 minutes from right now), and generally puttered. How a single event can manage to be both so much work and so very much fun, I haven't quite figured out. Work highlights: I thought the "How D&D Minis Changed My Life... or at least my game" seminar went really well. The Eberron Delve seemed to be well-received, which is good considering that I put so much work into it that I'm far behind on my current project. The D&D Open, which I helped Andy Collins write and ran one of the semifinal rounds for, was a big success. The Eberron seminar was great. Fun highlights: Friday night I stayed up very late playing D&D (gasp!) with Andy Collins , Gwen Kestrel , Steve Schubert (a regular in my Eberron campaign and, starting Monday, a new member of our development team), Ari Marmell (an established freelancer who's done a lot of work for White Wolf and is now working on a project with me) and his wife George, and Colin Suleiman (ditto what I said about Ari). Colin was gracious enough to run an Eberron adventure on the spur of the moment for us. Now, that's gutsy! Running an Eberron game for me, and without prep time! All right! It was enormous fun. I played a kalashtar bard named Halharath, whose stats I'll have to put up here later. Saturday night I stayed up very late talking with Jesse Decker (development manager) and Charles Ryan (brand manager for D&D), mostly about work stuff—but high-end work stuff, business decisions I have no part of, that sort of thing. It was a little strange for me, because most of the time I think of myself as just a designer who wants to sit in his cube with his head down and design stuff, dammit, and not be bothered with discussions about how we run the business. But then I find myself in conversations like this and discover that I'm actually very interested in how we run the business. Go figure. Fortunately, after a week back at work, I'm pretty much back in head-down-in-the-cube mode. Which is why I got up at 5:00 A.M. this morning—to WORK! And it's 6:20 and all I've done is post in my stupid blog! Aaagh! Politics: I designed a bumper sticker and I'm selling it (at no profit) through Café Press . Religion: I bought a book at Borders the other night that I really like. I've been on vacation all this week, enjoying a visit with my family and friends in Ithaca, New York. I find it amusing that my friends in Ithaca all talk about how rainy Seattle must be. I'm pretty sure Ithaca gets more inches of annual rainfall than Seattle does. OK, no, according to my quick Google search, Ithaca gets 35.4 inches of rain per year, compared to Seattle's diluvial 36 inches. But compare Seattle's annual snowfall (8.6 inches) to Ithaca's 67.3 inches! When we were packing for the trip, I waffled about how much D&D stuff to bring. 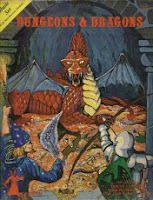 Coming home to Ithaca is often an opportunity to play D&D (see the SPQR Adventure Journal ), but it used to be that it was the only chance I got to play and that's not so much true any more. I planned to bring my Eberron book since I had hoped to get some work done on my novella, and I've got my laptop which has PDFs of the three core books on it. So I threw the two tubes of dice I bought at Origins into the suitcase and figured I had my bases covered—if a D&D game arose, there's an adventure in the back of the Eberron book I could run. I was pretty surprised, frankly, that David Lieb was the one who seemed most eager to get a game together, when I had lunch with him on Wednesday. David has always been a casual player—he learned how to play in college when we had some summer campaigns going, he's never bought a D&D book that I know of, and he's always seemed more interested in playing as a social activity than in the game itself. Not that there's anything wrong with that. I think a lot of D&D players fit that model to a T.
There were two flaws in my perfect plan about what D&D stuff to bring. First, I figured folks would make up new Eberron characters in order to play "The Forgotten Forge," but these guys don't want to make up new characters and we don't want to spend the time doing that. Second, I no longer remember how to play D&D without miniatures. So I came up with a perfect plan. I went to my Friendly Local Game Store here in Ithaca, had a nice conversation with one of the owners, and bought two Giants of Legend Huge Packs. I brought the minis home, put together 5 encounters appropriate for 5th-level PCs, and ended up using 14 of the 18 minis in those boxes. Yet another example of "How D&D Minis Changed My Life... Or At Least My D&D Game," which is a seminar I'll be participating in at GenCon this year. I pretty much randomly placed those encounters in the dungeon map from the back of the DMG. I loosely set them in a framework vaguely tied to the last adventure they were on (as well as I could remember it), telling them they had to stop some crazy cultists from releasing a dragon imprisoned beneath the Egyptian city of Tanis. The PCs were Denis (played by Mark Lawrence and represented by a Deepshadow elf mini), Hal (played by Paul Gries and represented by Lidda, Adventurer), and Rakh (played by David Lieb and represented by the orc brute). The encounters started off with a pair of fighter bandits (Regdar, Adventurer and Dwarf Sergeant), and a drow fighter and its displacer serpent pet. The next encounter was a minotaur skeleton, a zombie, and a ghast, which scared the wounded PCs enough (especially after the minotaur's axe hit Rakh once) that they closed the door and retreated back to the drow's room. They later encountered just the minotaur skeleton in the hallway, then fought a lizardfolk rogue and a grick. Rakh really shone as the group's fighter, despite being a single-classed rogue. The climactic encounter included the ghast and the zombie from the earlier room, along with a tanarukk and a warforged fighter, the leader of this group of psychos trying to free the imprisoned dragon. Denis finally came into his own in this last fight, getting off a successfulhypnotism on the warforged fighter and turning the zombie, allowing the others to focus on the ghast and the tanarukk until they were out of the way. The minis I didn't use: Medium astral construct, Mordenkainen the Mage (the one from these two boxes that I didn't already have, so I don't at all mind not having used it), a Huge gold dragon (my second; I'm hoping to trade it for a red dragon, which is the one Huge I don't have yet), and a bulette (which I planned to use, but decided that it would tear this group apart). Admittedly, 40 bucks is a fair bit of money to spend for a night of pretty random adventuring. On the other hand, I'm convinced that we had more fun than we would have had if I had spent money on, say, an issue of DUNGEON to find an adventure we wouldn't have finished by 2:30 am and we would have played without any minis at all. And if we had decided to share that expense, 10 bucks each is less than we would have spent going to the movies, and we played D&D for a good four and a half hours—longer than even Return of the King. And I don't much mind not sharing the expense, since I get to keep the minis and use them over and over again. Last, random comment more directly related to the Imperium Romanum campaign: I got an email today informing me that a link to the SPQR pages on my site has been added to an online encyclopedia entry about Hispania Terraconensis . These people need to research their sources more carefully! It might be fun, if we start visiting Ithaca more often again (it's been two and a half years since our last visit), to try to build this campaign up again. Things have been pretty random when we've played the last several times, and it would be nice to re-establish some themes of plot and continuity and the calendar, and that sort of thing. But that might mean getting the rest of these guys to think about D&D between gaming sessions again! We played my Eberron campaign again last weekend, and once again had a fabulous session. I was very short on preparation time, and with a great deal of guilt I ended up running an adventure from DUNGEON, called "Mellorn Hospitality." I won't spoil the plot, since it's from a fairly recent issue and there may be people out there reading this who are playing in it... or about to. I made some adjustments to the adventure, most of them necessitated by setting it in Eberron and on the continent of Xen'drik—so read "catfolk" for "elves" and "Shavarath" for "Hades" (which was a little weird; if you've read or played the adventure and know Eberron you can probably figure out why). But it was a fun adventure. The pace built steadily to a really dramatic climax, with the main villain of the adventure fleeing to Shavarath, the PCs in hot pursuit. Considering that was an EL 10 encounter, these five 5th-level characters (actually, Gwen's character was still 4th!) handled themselves remarkably well. The artificer proved to be the hero of that climactic encounter, using personal weapon augmentation (making his crossbow a bane weapon) in combination with true strike to dish out lots of damage where the other characters were only doing 3 to 7 points per hit with damage reduction and a couple of well-placed rays of enfeeblement slowing them down. Great fun. All the characters went up a level, except Crucius, who had started at the very bottom of 5th level and didn't quite get enough XP to hit 6th. Next month most of us will be at GenCon, and I'm planning to do another short one-shot sort of thing. We'll see. I've received more email in response to my "Am I still a believer?" essay than about just about anything else I've written, with the possible exception of Oriental Adventures. That's heartening somehow. I felt like I was really going out on a limb by including anything that personal and overtly religious on my site, but honestly my desire to write and post stuff like that was part of the reason I moved to the new site format in the first place. So hey, thanks to everyone that's written to me about it—thank you very much for your concern, your support, and just for taking the time to write. We tried another new church this past Sunday—a joint UCC/Disciples congregation in Renton. It was really good. But for only the second or third time, the full implications of my recently-diagnosed gluten problem were driven painfully home to me. I was diagnosed with celiac sprue last October. As a vegetarian, that leaves me able to eat... pretty much nothing. So it's been hard. But realizing that I could no longer take Communion was very difficult. For a while we were going to a service at a Methodist church called "Coffee, Donuts, and God"—my son really liked it. But I think that the first time we were there on a Communion Sunday might also have been the last time we went, despite the pastor's willingness to accommodate my needs in whatever way I felt necessary. That was the first time it hit home. Hey, Methodists only celebrate Communion once a month—or that's been my experience in most churches, anyway. So that's not too bad. But Disciples celebrate it weekly. I went (alone) to a different Disciples congregation last week, and hardly gave a second thought to the tray of tiny crumbs of bread as it went past. I'm not sure why it got me so much harder this week—maybe because it was a real loaf of bread going past me, untasted, down the pew, or maybe because I felt up to that point much more like a part of the body in that church, or maybe because I felt like I was being kept from the Feast. Our overall experience in this church was wonderful, and I'm sure we'll go back, maybe this next Sunday. But at some point, hopefully soon, I need to talk to the pastor about getting an alternative bread on to that plate before I have to pass it down the pew again. Because that's a feast I want to be a part of. Wizards of the Coast is celebrating the 30th anniversary of D&D all this year, but the party—sort of a launch for the celebrating season, I guess—is this afternoon. (I'm writing at almost 2 a.m.; I'll explain why in a sec.) I figure this will be the first party to celebrate this event, to be followed by a big party at GenCon and then Worldwide D&D Day on October 2nd, which will be celebrated in game stores around the world. Hey, 30 years is a lot to celebrate. So we're having a company-wide party this afternoon, in the courtyard at the center of our office buildings. But when this was first announced, I posted to an internal message board for RPG R&D that we'd be doing something wrong if we didn't, as a department, actually play D&D that day. Then I made the mistake of mentioning it again in a department meeting this week. So on Tuesday, I got permission to coordinate just such a game, which I'll be running in the morning. The adventure, such as it is, should be fun. We're playing from 9:30 to 12 (when the party starts)—not a very long time, so I tried to keep it simple. But I also wanted to suggest the momentousness of the occasion by hearkening back to the early history of the game, as well as use some of the cool Giants of Legend minis we're all collecting at this point. So I'm doing a pastiche of Against the Giants, in four encounters—Steading of the Hill Giant Chief (fight Nosnra and his hill giant and ogre buddies! ), Glacial Rift of the Frost Giant Jarl (this one's just the Jarl with a couple of winter wolves), Hall of the Fire Giant King (Snurre and a couple of fire giants), and "Vault of the Drow" (Eclavdra and some drow lieutenants). I've got a couple of interstitial encounters in case these ones go more quickly than I anticipate—but that would surprise me a great deal, since I told people to bring 9th-level characters, and these encounters start at EL 11 and go up from there. But I'm pretty much figuring on running a whole big batch of PCs, which should help keep them alive. So that's why I'm up so darned late—finishing up the stats for the drow, primarily. And watch—they won't even get that far. You wait and see. There is no logical explanation for why I'm posting now, however. Now that I'm done statting out all the giant rulers and drow nasties, I should be flopped in bed getting some sleep. Thirty years of D&D. Man, that means I've been playing for 25 years—yeah, my personal gaming anniversary has probably just passed quite recently, unobserved and unremembered. Yep, I started playing in 1979 with this boxed set, a few months before my 11th birthday. I must have bought the fourth printing, according to this page. That's pretty cool. They sure were reprinting them quickly. But who knows how many copies were in each print run? It's hard to prove, but general opinion around the office is that, despite the nostalgia with which the media typically approach D&D these days, it's actually bigger now than it was in the '80s. As in, more people playing, more people buying our books, a larger community of gamers than in the years that were supposedly D&D's height. Yeah, OK, that sleep thing is sounding pretty good right now. I called my parents yesterday and caught them at the end of dinner. They had hamburgers, corn on the cob, and potato salad. "It's tradition," my mom said. And of course, my dad blasted his weird 19th-century version of the Star-Spangled Banner as a chamber-music waltz on the stereo first thing in the morning. What did I do? Well, I vacuumed. (Hey, that's a big deal.) I, once again, couldn't muster the energy to try another new church. I think we had nachos for dinner, or else a very late lunch that turned dinner into a much more casual thing. I can't remember, that's what's really weird. I read a couple more chapters of Harry Potter and the Order of the Phoenix to my son when he got tired in the evening, and then the teenagers across the cul-de-sac started setting off fireworks, and we all watched them until after 10. I think he was awake until 10:30, running from one side of the house to the other to see as many of the fireworks being set off around us as he could. We briefly talked to him about what Independence Day is about, why we celebrate it. Of course, there's no explanation for why we set off fireworks—I'm pretty sure that it has more to do with a love of explosives than with a particularly strong feeling about independence. Is it true that, in some other countries, fireworks are a traditional way to celebrate Christmas? Vegetarian and celiac, hamburgers are not a viable option for me. We don't even own a grill, though our downstairs deck seems to have been made for grilling on. We spent the day together as a family, celebrating our interdependence. Hey, now there's a tradition. I got back from Origins on Monday, took Tuesday off, and spent Wednesday wading through the emails, expense reports, and missed work waiting for me when I got back. Wheee. But it was a great trip. I arrived late Tuesday night and pretty much went right to bed. Wednesday I went to help set up the booth and discovered that the diorama we were using for the Dungeon Delve was not there. It got shipped fast and made it there before noon on Thursday—with the exhibit hall opening at 1:00! So I actually skipped out on some of the hard setup and went back to my room to get some work done. In the afternoon I went back and did help more with setup. Then I played a game of Risk Godstorm with Charles Ryan and Eric Cagle. We played right outside the exhibit hall, so lots of people stopped to watch and ask about the game. We told everyone it was going on sale the next day in the WotC booth, and so we take credit for it selling out over the course of the weekend. :) Charles creamed us, despite not having played any form of Risk since college. On my last turn (the last turn of the game), I owned a single territory: plague-ridden Gaul. I got three armies to place in that territory, and two of them promptly died from the plague. Because I hated him at that point, I attacked Charles in Brittania. He rolled a one for his defense! Perhaps I could win one small victory before the end of the game! Alas, no. My plague-ridden Greco-Gauls rolled a feeble one on their attack as well. Game over. I had a ton of guys in the Underworld, but it just didn't matter. Thursday morning we got the Delve set up in time for the opening of the hall, and I spent pretty much the next four days talking to people about Eberron. I was pleasantly surprised at the very positive reaction it received—lots of people were really excited about it, we sold a whole bunch of the books in our retail area, and I signed quite a number of them. OK, if I keep trying to write about everything I did the whole weekend, I'm simply never going to finish this entry that I started three days ago. Saturday night I played in a Call of Cthulhu game run by Jeff Simpson, who does web work for the RPGA and must be the nicest person at Wizards. He's been running this game, set in Roman Britain near Hadrian's Wall, at conventions, with the players consisting of volunteers who help out at conventions. Great fun. So... not enough sleep, too much fun, a couple of great games, and lots and lots of Eberron—I call Origins '04 a success. Just about the only down side was the Origins Award ceremony Friday night—Draconomicon did not win either category it was nominated in (Best Roleplaying Supplement and Best Graphic Design of a Book Product, or something like that), and Wizards as a whole won no awards (though DRAGON Magazine won Best Periodical). I'm slated to head to GenCon Indy in August, so more convention news then! I had a conversation in the kitchen at work the other day with one of our customer service reps. He had seen my presentation about Eberron at Wizards' Game Day a couple weeks ago and complemented me on it, so we're suddenly closer to a first-name basis, I guess. He said he'd heard I was a minister, or used to be. "Yeah, I used to be. I fled." That's my standard answer—sort of funny, deflecting the seriousness of the question. Yeah, there's this huge whole part of my life, from the time I got religion in college through three years of seminary and three more years as an ordained minister, and then I fled. Some people find that fascinating: a former minister now working at Wizards of the Coast writing Dungeons & Dragons books. It's a weird juxtaposition, sort of a living oxymoron, like a guy with a Ph.D. driving a garbage truck or something. Sure, it's curious. But those are not people that I'm particularly interested in talking with about the reasons I left ministry and the path that brought me where I am. Let them enjoy the living oxymoron and move on. But this guy in customer service was coming at it from a different angle. "Are you still a believer?" he asked. He is, too—not a former minister, but a believer, a Christian, and someone who might want to go to seminary someday. See, now that's a whole different line of questioning. Unfortunately, I answered that with the same kind of ha-ha reply, something like "Yeah, more or less." And when Rich Baker showed up in the kitchen I quickly took the opportunity to mention something I'd been wanting to talk to him about. Not so much because I didn't want to talk about my spiritual path with a fellow believer, but because I didn't want to do that in the kitchen at work. But man, that's not an easy conversation to have. Am I a believer? Hell, I don't know. I believe a lot of things—some of them fairly orthodox by the standards of twenty centuries of Christian theology, some of them much less so. Some of them I have pretty strong opinions about, maybe even convictions. Others I think I still believe but I haven't really tested them in a while to see if they're still actual beliefs or just lingering ideas. Example: My wife asked me a couple of weeks ago what I believe church is. My answer was something like this: I used to believe that church is a group of people called to live in the world as a colony of Heaven, a group patterned after the way relationships should be in God's new creation. I used to believe that church is a place where we celebrate the sacrament of Communion in anticipation of the great feast to which God will call us someday, gathered around a common table at which all are welcome to celebrate the grace that brings us together. Do I still believe that's what church is? I don't know. Those are pretty beliefs. That's a very attractive idea about what church is. But there's a big part of me that shakes my head sadly at the beliefs of a very naïve 20-year-old preaching his first sermon in his college church, talking about what he hoped church could be and what he dreamed his time in ministry would be about. There's a part of me that sheds bitter tears over my own experiences, and those of my friends, about what church actually is. The woman in my smaller church in Ohio who scowled at me from her pew every Sunday morning, shook her head as I preached, just never liked me and was glad to see me go. The Board of Ordained Ministry that heard my ambivalence about my sense of call and denied my wife her elder's ordination at the point in her life when she was most certain of her own call. The congregations who have shunned people for personal or dogmatic reasons, the well-meaning believers who still try to bar people from the Communion table, either as guests or as hosts. I haven't yet figured out how to relate my pretty beliefs to my bitter experience. I guess I haven't really taken the time to try. It's true, I fled ministry. With people who are closer friends, I'm willing to delve into some of the reasons I fled. Pretty much my standard answer has become that I'm just too much of an introvert to have been a successful minister. That is true, but it is only part of the whole truth. I am very much an introvert, and that did interfere with my success as a minister, and that makes me angry. I am angry that most of the ministers I know, and whose churches I visit now in an ongoing search for a new community to call home, are not like me, or at least they do not seem to be. They are very outgoing, dynamic people, able to negotiate awkward social situations and hospitals and funeral homes with ease, full of certainty and security and platitudes I never could believe. They are not mystics and contemplatives, and they are not introverts. I feel as though the deck was stacked against me from the beginning, like my Myers-Briggs profile indicated right off the bat that I would not be a successful minister. More importantly, I guess, I feel as though my ideas of church were just completely unrealistic, an impossible dream setting me up for failure and disappointment. I wanted ministry to be about spiritual growth and contemplation, I wanted church to be about experiencing the Reign of God in joyful anticipation, "a foretaste of the feast to come." It wasn't, and I fled the reality of what it was (which, in addition to the bitter things I already mentioned, included a great number of people who truly loved me and were very sad to see me go). And having fled the ministry that was not what I dreamed it would be, it seems that I also fled the dream of spiritual growth and contemplation, abandoned the hope of experiencing God's Reign in foretaste, and have resigned myself to accompanying my wife and son on an apparently never-ending quest to find a church where we can belong, feel at home, settle in and grow. It has been eight years since I fled ministry and Ohio. I've lived in Madison, in Berkeley, and now around Seattle, and still have not found a church I'm happy in. I guess that I'm still looking for a church that is a colony of Heaven, a community gathered to celebrate the feast of anticipation. Am I still a believer? I guess the real answer to that question varies from day to day, in direct correlation with how much hope I still have of ever finding that church. As I think more deeply about it, however, I realize that I am still convinced I will find it someday. Perhaps not a community called to be a colony of Heaven, perhaps not a community gathered to celebrate the feast in anticipation, but the actual feast in the realized Reign of God. I guess I've never been exactly sure what form that feast will take or what the Kingdom of Heaven really is, but I know that the promise is at the heart of what I do believe, the invitation still tugs at my soul and draws me back toward the life of the spirit. One of the things that reassures me in more doubtful times that I actually am still a Christian is that I frequently listen to Christian music. (That is easily a topic for a whole other long post.) Anyway, a playlist that frequently gets played from my iPod is this one [link will open the iTunes music store]—all about that invitation, that promise, and the home that awaits us. In these songs, I feel that tug at my soul, I hear the promise that God will not always be a distant and alien Presence whose voice as often comes from the whirlwind as in sheer silence, but will someday be, as God sometimes is even now, as close as my heartbeat, right at hand to wipe the tears from my eyes. I guess I am still a believer, and I'm frankly a little startled to realize how much I do still cling to that promise in the depths of my heart. Yes. Yes, I am. On Tuesday I take off for Origins in hot and moist Columbus, Ohio. I've got to say, I love summer on the West Coast. In general, even when it's hot as blazes here (as it was during my D&D game yesterday, at least inside the house) it's not particularly humid. Heading back eastward for summer conventions always makes me realize afresh how much difference humidity makes. I am also going to GenCon Indianapolis in August. There I'll be participating in seminars as well as staffing the booth, including one seminar all about Eberron. I'll post my seminar schedule when I know it. I'll try to post some news from Origins when I get back. So the campaign began in January with the adventure that will see print in DUNGEON next month, "The Queen with Burning Eyes." It's a classic sort of dungeon delve, with the weird twist that all the rooms are constructed from miniatures terrain tiles. For that matter, in the published version of the adventure, I suggested miniatures to use for every encounter. After playing through that adventure, the characters traveled to the city of Sharn, where they hooked up with a professor at Morgrave University for an expedition to Xen'drik. (One of the items they recovered in the first adventure turned out to be a key to a vault somewhere in Xen'drik, and in a later confrontation with the Emerald Claw necromancer Demise they recovered a second key to the same vault.) They fought some sahuagin in the strait of Shargon's Teeth, encountered some incompetent Emerald Claw agents in Stormreach, and sailed near the location of the Lost Vault they sought. Journeying into the jungle of Xen'drik, they encountered a harpy who informed them that Tzaryan Rrac of Darguun sought the same treasure as they did, and claimed it for his own. They dispatched both the harpy and a batch of gnolls working for the Darguun warlord with ease, and made their way to the enormous steps of the Lost Vault. The drow guards there proved ill-equipped to withstand the PCs' assault, and the remaining denizens of the Vault—an owlbear, a pair of ogres, a drow wizard with some Abyssal eviscerator allies, a water elemental, and even an erinyes—all fell before their might. They emerged from the Vault with a horde of lost treasure, including a glowing iron rod that Professor Karrna seemed particularly interested in bringing back to Sharn. Upon emerging from the Vault, a black dragon intercepted the characters, spouting off cryptic remarks like, "The world is not ready for that which you bear," and, "If I perish, so do many, but you will be stopped." They defeated the dragon, then faced still more minions of Tzaryan Rrac: orcs, another ogre, and a displacer beast. It seems they have found the treasure that both the Emerald Claw and Tzaryan Rrac are desperate to claim. But what do the mysterious dragons of Eberron have to do with it? So today they made their return trip as far as Stormreach. We started the day off with a bang, since I got my first Giants of Legend miniatures this week: a bulette. The fight went pretty well, considering that the characters were only 4th level—they would all have survived had it not been for the critical hit it got on Gwen's wizard, killing him outright. Gwen went off to make another character, while the others proceeded, fighting a trio of werewolves (who seemed to really hate Andy's shifter, even going so far as to call him a "mudblood," though I can't believe I used that word in a D&D game, and one of them taking two attacks of opportunity from other characters in order to go attack Andy). Then they returned to where they had left the launch from the ship they came in on. Near the launch, they were attacked by a group of lizardfolk—5 ordinary lizardfolk and one rogue (the GoL mini). That was a pretty easy fight, but the pair of sea cats out on the water was tougher—especially since one of them was just attacking the boat. It turned out to be pretty exciting to see Andy's shifter hanging on to the edge of the larger ship while Professor Karrna tried to climb up him from the launch before the sea cats pulled it down under the water. All while the pirates up on the deck, who had captured their ship, were shooting scorching rays and crossbows all over the place. The pirate warmage died pretty quickly, his quasit ally fled the scene (after his cause fearmade Cam's warforged run like heck), and the pirates fell in short order... especially once the fear wore off. Gwen's new character had been working (rather unwillingly) with the pirates, but aided the PCs from the start of that encounter. Back in Stormreach, lots of shopping took place, and the artificer made a lot of stuff, and we closed off the day with one more fight against the Emerald Claw. This time it was a party of four enemy agents: a cleric of the Blood of Vol, a barbarian/fighter (Axe Sister mini), a Daring Rogue, and a kalashtar wizard (with a striking resemblance to an elf of Evermeet). They went down pretty quickly, too, to my chagrin. I think that the sheer size of my web site, with its different sections and somewhat Byzantine organization, has been an obstacle to my updating it with any regularity. Updating it has become a chore, and I have no time in my life for chores. For that reason, I've decided to try this change to a blog format. In theory, this will both encourage and help me to update more frequently, without having to make a big production out of every update. I'm sick today, home from work and tinkering around with this iBlog software demo. I started feeling just really tired about noonish yesterday, and got progressively worse as the day went on. By the time I got home a little after six, I had a fever over 100°, and I just went to bed. I thought seriously about throwing up around 8. By midnight, the fever had passed. I still feel pretty out of it, hence the whole being home thing, but I'm sure glad I don't feel as bad as I did yesterday. It's bad timing: I've got a deadline tomorrow, for the d20 Modern book I've been working on. So I'm planning to keep working at home today, in between what I hope will be frequent naps. I haven't eaten since lunch yesterday... hm... am I up for it? Next week I start a period of serving on the development team, looking at a core D&D book and an Eberron supplement. Speaking of Eberron--it's showing up in various places now. The first place I heard of it being on sale was in Finland, then Germany. Anyone got it in the U.S. yet? I'm very excited about its release.